Although they are not often studied from a literary perspective, the spiritual writings of these saints provide early examples of Catholic devotional poetry. 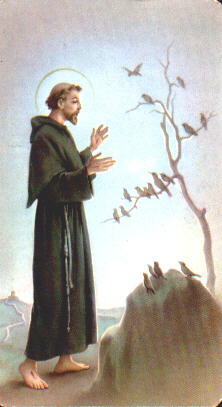 St. Francis of Assisi – Several poems praising God and nature are attributed to St. Francis, founder of the Franciscan Order. St. Hildegard of Bingen – This Benedictine visionary’s prolific writings include poetry, hymns, and theological treatises. St. Teresa of Avila – A Spanish mystic and Camelite nun, St. Teresa documented her spiritual evolution through poetry and other theological works. Francesco Petrarch – Petrarch, considered by many to be the father of Humanism, is also credited with the development and popularization of the Italian sonnet. Geoffrey Chaucer – The undisputed father of English poetry, Chaucer is best known for his memorable portraits Canterbury pilgrims in The Canterbury Tales. Dante Alighieri – Dante Alighieri’s epic poem La Divina Commedia presents an allegorical vision of the afterlife and is among the most significant works of Western literature. Gerard Manley Hopkins – Hopkins was a Jesuit priest and is generally considered one of the greatest poets of the Victorian era. Hilaire Belloc – Belloc was a controversial figure known for both his radical political views and his mastery of light poetry in the style of Lewis Carroll and Edward Lear. Thomas Merton – A monk who lived in isolation for several years and one of the most well-known Catholic writers of the twentieth century, Thomas Merton was a prolific poet, religious writer, and essayist.